In this plant, the advance team is chaired and actively led by the most senior manager on the site. He is actively coaching, he is actively being coached. He is questioning his own learning, seeking council, and acting on it. They are clear that, while there may be general guidelines, they must learn by trying and experimenting. They cannot simply deploy a roadmap because they can only see the next mile on a 1000 mile journey. They see it as a method to shift their culture away from its “tell me what to do” legacy and toward one of an empowered workforce that takes initiative and works on the right things, the right way. There is no doubt among the leadership team that this is the path forward. They are starting to apply the language of the Improvement Kata informally in their meetings and discussions. Overall, it seems a bit messy. But learning is like that. The “implementation of Toyota Kata” is a directive from the corporate Continuous Improvement team. The corporate team spends much of their energy developing and deploying templates, PowerPoint presentations, setting standards for the forms and the layout, lettering and colors on the improvement boards, and setting milestones. They have published a step-by-step procedure for a site to implement Toyota Kata, based on their assumptions of what ought to work. None of them has actually led a change like this. They are, in turn, working through the site continuous improvement team who is expected to execute to these standards. The site leader receives weekly reports on progress. Training the managers and “implementing Toyota Kata” is the responsibility of one of the site’s continuous improvement staffers. The site leader questions him using the 5 Questions each week, and issues direction in response to the answers. It is the continuous improvement practitioner who is responsible for motivating the members of the management team to challenge their own processes and develop their improvement boards. A significant number of them are questioning the need or purpose of this exercise. Unfortunately I run into the second case far more often than I see the first. But the story is decades old. That is how we did Six Sigma, kaizen events, Theory of Constraints, Total Quality Management. In each case we have separated the deployment of a core change in the way we manage operations from the responsibility for actually managing. What are the underlying assumptions about the people at the gemba when “standards” are established thousands of miles away, published, and then audited into place? Why do they feel they must tell people exactly what to do? What do they feel is lacking on the site? Competence? or Clarity? 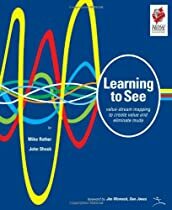 With the publication of Learning to See in 1999, Mike Rother and John Shook introduced a new genre of book to us – a mix of theory, example, and practical application. The story invites the readers to follow along and actually do for themselves. This is one of those books that gives a bit more every time I read it. The more thorough my baseline understanding of TPS, the more I get from some of the nuances of Rother and Shook’s intent. At the same time, I am beginning to formulate an idea that perhaps this book is often used out of its intended context – maybe a context that was assumed, but left unsaid. I’d like to share some of the things I have learned over the years, especially as I have worked to integrate the concepts in Learning to See into other facets of the TPS – especially research by Steven Spear, Jeff Liker, and of course, Mike Rother’s follow-on work Toyota Kata with my own experience. Learning to See introduced the term “value stream” to our everyday vernacular. Although the term is mentioned in Lean Thinking by Womack and Jones, the concept of “map your value streams” was not rigorously explained until LTS was published. To be clear, we had been mapping out process flows for a long time before Learning to See. But the book provided our community with a standard symbolic language and framework that enabled all of us to communicate and share our maps with others. That, alone, made the book a breakthrough work because it enabled a shorthand for peer review and support within the community. It also provided a simple and robust pattern to follow that breaks down and analyzes a large scale process. This enabled a much larger population to grasp these concepts and put them to practical use. Find a change agent (how about you?). Seize (or create) a crisis to motivate action across your firm. Map the entire value stream for all of your product families. Pick something important and get started removing waste quickly, to surprise yourself with how much you can accomplish in a very short period. Learning to See focuses on Step 4, which implies establishing a future-state to guide you. In the Forward, Womack and Jones commented that people skipped Step 4 (map your value streams). Today, I see people skipping straight to that step. Let’s continue the context discussion from the Forward, then dig into common use of the value stream mapping tool..
“Find a change agent (how about you? )” is a really interesting statement. “How about you?” implies that the reader is the change agent. I suspect (based on the “change agents” discussed in Lean Thinking that the assumption was that the “change agent” is a responsible line leader. Pat Lancaster, Art Byrne, George Koenigsaecker were some of the early change agents, and were (along with their common thread of Shingijutsu) very influential in the tone and direction set in Lean Thinking. Lead highly collaborative action-based team efforts to clean out, simplify and mistake-proof our processes and our strategic suppliers’ processes. This includes using proven methodological approaches, applying our culture and providing our team with technology, best cross-industry practices and all other resources needed to attain ever higher levels of productivity and customer delight. Endlessly define, prioritize and present opportunities for applying AWO’s, GB/BB projects and other LEAN principles to our supply chain and customer deliverables. Develop, plan and execute the plans as selected by the business leaders. Train all team members (and other selected individuals) in LEAN principles and mechanisms to be LEAN and preferred by customers. Document procedures/routines, training, team results/best practices and the like. Coaches business team members in the practical application of the Lean tools to drive significant business impact. Leads and manages the current state value stream process. Develops and implements future state value stream processes. Responsible for planning and assisting in the execution of various Lean transformation events targeted towards improving the business’s performance on safety, quality, delivery, and cost. Focuses on business performance that constantly strives to eliminate waste, improve customer satisfaction, on-time delivery, reduce operating costs and inventory via the use of Lean tools and continuous improvement methodologies. Acts as change agent in challenging existing approaches and performance. Whew. With all of that, here is my question: What is the line leadership expected to do? In other words, what is left for them to do? And what, exactly, are they supposed to be doing (and how) during all of this flurry of activity? While all of the “change agent” examples outlined in Lean Thinking (which, in turn, provides context for Learning to See), are line leaders, all too often the role of “change agent” is delegated to a staff member such as the above. I believe it is entirely possible for a line-leader change agent to also be the “sensei” – Michael Balle’s The Lean Manager shows a fictional scenario that does just that. But if your “sensei” is a staff technical professional, or an external consultant, the “change agent” function is separate and distinct, or should be. That question can be a pretty confrontational. But it is a question that often goes unasked. This is especially true where “getting lean” is an initiative delegated to staff specialists, and not directly connected to achieving the strategic objectives of the business. In these cases, “Lean” is expressed as a “set of tools” for reducing costs. I do not believe that “creating a crisis” is constructive, simply because when motivated by fear people tend to (1) panic and lose perspective and (2) tend to apply habitual responses, not creative ones. If there are high stakes at risk, creativity is not what you should expect. On the other hand, a narrow and specific challenge that is set as Step Zero helps focus people’s attention and gives them permission not to address every problem all at once (which avoids paralysis and gridlock). These are appropriate roles for the “change agent” – and they are things that can only be effectively done from a position of authority. Which brings us to back to Learning to See. We say that a “value-added step” is “something the customer is willing to pay for.” A “non-value-added step” is anything else. Some non-value-added steps are necessary to advance the work or support the business structure. Right away we are limited. The only way to grow the business using this approach is to use the newly freed up capacity to do something you aren’t doing now. But what? If that decision hasn’t been made as a core part of the challenge, the leaders are often left wondering when the “lean initiative” will actually begin to pay – because they didn’t answer the “Why must we do this?” question from the beginning. Try to quantify the waste that is seen. This would be things like inventory, walking distance, scrap, etc. that are easily measurable. More sophisticated models would try to assign value to things like floor space. Determine a return on the investment, and proceed if it is worth it. The idea, then, would be to deliver those savings quickly with some kind of rapid improvement process. This fundamental approach can be (and is) taken at all levels of the organization. I have seen large-scale efforts run by a team of consultants doing a rapid implementation of an entire factory over a timespan of a few weeks. I have also seen that same factory six months later, and aside from the lines that were painted on the floor and the general layout changes, there was no other sign the effort had ever been undertaken. In this case, no matter how compelling the ROI, they didn’t get anywhere near it. One of the tools commonly (ab)used for this process is value stream mapping. Map your current state map. Identify sources of waste and other opportunities on the current state map. Depict those opportunities with “kaizen bursts” to show the effort you are going to make. Based on what opportunities you have identified, and your proposed kaizen bursts, develop the future state map to show what it will look like. Develop the new performance metrics for the future state. Viola – make the case to go for it. Now – to my readers – think for a minute. Where are the “kaizen bursts” in Learning to See? They are on the current state map, right? If, on the other hand, I were to ask “What value do we wish we could create for our customers that, today, we cannot?” I open myself up to a host of possibilities, including creating a new value stream that currently doesn’t exist at all – using freed up resources, at essentially zero net cost (or at least heavily subsidizing the new effort). In the “find and eliminate waste” model, the staff-change agents are often responsible for the “lean plan.” Like the job description above, they are charged with convincing the leaders (who hired them!) that this all makes business sense. To reduce that overly long lead time from raw material to finished goods, you need to do more than just try to eliminate obvious waste. This statement implies that the value stream mapper is dissatisfied with the current lead time, and has a compelling need to change it. What you are looking for in the Future State is how must the process operate to get to the lead time reduction you must achieve. For example, given a target lead time and a takt time, I can calculate the maximum amount of work-in-process inventory I can have and still be able to hit that objective. I can look at where I must put my pacemaker process to meet the customer’s expectations for delivery. Based on that, I can look at the turns I must create in the pull system that feeds it. Based on that, I can calculate the maximum lot sizes I can have; which in turn, drives my targets for changeovers. As I iterate through future state designs, I am evaluating the performance I am achieving vs. the performance I must achieve. What is stopping me from making it work? If something is too hard to change, what can I adjust elsewhere to get the same effect? In the end, I have a value stream architecture that, if I can solve a set of specific problems, will meet the business need I started with. This is my view on the fundamental difference between creating a generic “crisis” vs. stating a compelling performance requirement. The process outlined in the book is to develop the future state, and then identify what is stopping you from getting there. Of the eight KEY QUESTIONS FOR THE FUTURE STATE that are outlined in page 58, “What process improvements will be necessary for the value stream to flow as your future state design specifies?” is question #8. It is the last thing you consider. In other words, how must this process perform? The “bursts” are not “opportunities” but rather, they represent the things we have to fix in order to achieve the future state. In Toyota Kata terms, they represent the obstacles in the way of achieving the target condition, just at a higher level. Get the stamping changeovers down to 10 minutes or better. Get the weld changeovers to where we can do them within the takt. Get the welder uptime to 100%. These are the obstacles to achieving the performance we want from the future state value steam. Notice that the stamping press only has an uptime of 85% on the current state map. There isn’t a corresponding kaizen burst for that – because, right now, it isn’t in the way of getting where we need to go. It might be an issue in the future, but it isn’t right now. But if we were just “looking for waste” we might not see it that way, and spend a ton of time and resources fixing a problem that is actually not a problem at the moment. Thus, I suspect that Learning to See, like many books in the continuous improvement category, was intended for value stream leaders – managers who are responsible for delivering business results. In my experience, however, most of the actual users have been staff practitioners. Perhaps I should use the 2nd person here, because I suspect the vast majority of the people reading this are members of that group. You are a staff practitioner if you are responsible for “driving improvement” (or a similar term) in processes you are not actually responsible for executing on a daily basis. You are “internal consultants” to line management. Staff practitioners are members of kaizen promotion offices. They are “workshop leaders.” They are “continuous improvement managers.” The more senior ones operate at the VP and Director level of medium and large size companies. No matter what level of the organization, you are kindred spirits, for most of my post-military / pre-consulting career has been in this role. The people who actually read and study books like Learning to See are staff practitioners. This creates a bit of a problem, because Learning to See is very clear that the responsible manager should be the one actually building the value stream map. But often, that task is delegated to the staff practitioner. “Map this value stream, and please present your findings and recommendations.” If you have gotten a request or direction like that, you know what I am talking about. Been there, done that. In my personal experience, although it gave me valuable experience studying process flows, I can honestly say that relatively few of those proposed “Future States” were actually put into practice. Today we see Toyota Kata quickly gaining popularity. The Lean Bazaar is responding, and “coaching” topics are quickly being added to conference topics and consulting portfolios. I welcome this because it is calling attention to the critical people development aspect that distinguishes the Toyota Management System from the vast majority of interpretations of “lean” out there. But make no mistake, it is easy to fall into the tools trap, and the Lean Bazaar is making it easier by the way it positions its products. Just as value stream mapping isn’t about the maps, establishing an improvement culture isn’t about the improvement boards, or the Kata Kwestions. It is about establishing a pervasive drive to learn. In that “lean culture,” we use the actual process as a laboratory to develop people’s improvement skills. We know that if we do the right job teaching and practicing those skills, the right people will do the right things for the process to get better every day. Which is exactly what the title of Learning to See says. This video by Charles Duhigg is promoting his book The Power of Habit . I haven’t read the book but there is a lot of study that draws the same basic model. A habit is based on an urge to do something that triggers a reward (dopamine shot) in your brain. Every time it happens, the connection between the action and the reward gets stronger. The urge itself is usually triggered by some outside condition or stimulus. Take a look at the video, and then the flowchart beneath it (click on the flowchart for the full size version), then we will discuss what this has to do with lean thinking. When we talk about “change” we are talking about replacing one set of habitual responses with a different set of responses. Thus, it is important to understand that simply applying willpower is not enough for anyone (no matter how well intentioned) to change their fundamental behaviors. As you may recall, I am a big fan of the book Switch by Chip and Dan Heath. One of their key points is “Build Habits” and they discuss linking the desired response to a specific trigger. What we have to keep in mind is that the old responses also have triggers, and many of those triggers are subtle and below the level of awareness. Duhigg’s model is replacing one habit that does not get the results you want with a different habit that does get the results you want. The less dramatic this change, the better. That is why it is critical to “find the bright spots” (also from Switch), and even if they are not working perfectly, to structure your future state behaviors around them. For that matter, if you can find even a hint of the behavior you want, it is far easier to shape existing actions than to try to tell people they are “doing it wrong” and getting them to pick up something else. One of the elements of Deming’s model of “profound knowledge” is “knowledge of psychology.” Take a look at these tools and see if they help you be a more effective change agent. I have been touting Chip and Dan Heath’s book Switch for some time now, so it I thought I ought to actually write about why. If you are in the role of a “change agent” this book is your manual. Up to this point, the bible for “organizational change” has been John P. Kotter’s book Leading Change published by the Harvard Business School. Developing a vision and strategy. Empowering employees for broad based action. Consolidating gains and producing more change. I have found it quite valuable in the past to challenge a leadership team to assess their own efforts against these factors, then listen to what the next level down has to say. There is always a large gap – what the leaders THINK they are saying clearly is much more muddled to the listeners. What really hooked me into this book, though, was just how well it maps to key characteristics of a Toyota-style management system. People in companies that are exceptionally successful with continuous improvement have the same baseline thinking patterns as people in every other company out there. The difference is not about hiring different people, it is about how the work and the environment itself is structured. It is likely that structure wasn’t deliberate, these outlier companies just stumbled into it. But if we look at what makes them different (see “Find the Bright Spots” below), we can see they are better at dealing with the things outlined in this book. That, to me, is encouraging because it reinforces the idea that true operational excellence is within the reach of anyone who is willing to deal with the real issues. We (like to) Think It’s About Logic – But It Isn’t. In business we operate on the assumption that decisions are based on objective, rational analysis of facts and data. If presented with a compelling case, we say, the logical conclusion should follow. If they don’t get it, we think, it is because they don’t understand the goodness, so we need to explain it better. This thinking drives us to try to construct more compelling models and representations of “the system” in our effort to explain why it is better. If we address the emotional aspect at all, it is usually with trying to “create a crisis” or a “burning platform” – in other words, using fear as a motivator. Or, even worse (apparently), we try incentives to manipulate behavior. Switch uses a metaphor of the human psyche that is borrowed from Johnathan Haidt’s work in The Happiness Hypothesis. Haight constructs a metaphor of our mind as an elephant, representing our emotional responses, and a rider on the elephant, representing the logical and rational side of our mind. You can quickly get the idea here – the rider can influence where the elephant goes, but that’s about it. Unless the elephant feels safe going there, and trusts the rider’s judgment, it ain’t gonna happen. Following that metaphor, Heath and Heath outline nine actions that shape how groups (and individuals) respond to changes. The book describes them in detail, with stories, examples, and structure. Online, they have the Switch Workbook which provides a great quick-reference for the book. I highly suggest reading the book rather than trying to use the workbook as a substitute, though. Otherwise you lose a lot of context. The overview and comments below are organized the way the key points are covered in the workbook. Our metaphorical elephant rider is busy and stresses easily. Given too many choices, the rider becomes paralyzed and takes no action at all. So it is necessary to provide enough structure to allow people to focus their attention on “how to do it” rather than “what to do.” This means being far more explicit than we typically are. “Vision” is not an ethereal saying on the wall. It is a concrete description of how we want the organization to work. Rather than focusing on what isn’t working and trying to fix it, go find examples of where things are working and try to understand why – what makes them different. Often there are one or two key factors involved and, once understood, they are fairly easy to educate and replicate. Of course, to understand what makes them different, you must also understand the normal way things are done, and compare that with what you find in the positive outliers. If I were to use Toyota-style language, I would say “understand the current condition” and use the positive outliers as the basis for a target. Then look, at a detailed level, at what small things make such a big difference. This is a classic “is / is not” analysis, but applied rather than just theoretical. The most common theme of frustrations I hear from change agents and practitioners has to do with people “not supporting the changes.” But when I question them about what they WANT people to do, I often get a list of abstractions. To make things even more interesting, many of us (myself included) have been taught to focus on the physical process changes rather than the behaviors required in a continuous improvement culture. Be clear about how how people should act. This is one of the hardest – and most important – parts of the framework. As a leader, you’re going to be tempted to tell your people things like: “Be more innovative!” “Treat the customer with white-glove service!” “Give better feedback to your people!” But you can’t stop there. Remember the child abuse study [from the book]? Do you think those parents would have changed if the therapists had said, “Be more loving parents!” Of course not. Look for the behaviors. Another common source of frustration among practitioners is the comparison with perfection. Now there is nothing wrong with this. It is actually how we should think. But there is a difference between using perfection as your benchmark and expecting it to be achieved in one fell swoop. By setting a limited theme that you know will advance the process, you help people focus on specific actions – you script what they should be working on, and give them permission to not try to fix everything at once. The other thing that helps, according to the workbook, is keeping the change within the scope of how people think about themselves. It is far easier to reinforce behavior that fits in with an existing self-image than to try to change something so fundamental. Ah! That is something you can rally people around. At the same time, avoid abstract metric targets. “Gross margin” or “inventory turns” targets might be OK in the board room, but in the real world (which, unfortunately, rarely extends into a board room), you need something tangible that people can see and experience. The next three items come under the heading “Motivate the Elephant.” The elephant is the metaphor for our emotional responses to things. As much as the business world likes things to be sterile and logical, people never work that way. Our logical decisions always follow emotional decisions. If there is a misalignment between the two, we feel great anxiety. Haidt describes “the rider” (our logical mind) as a skilled attorney who can construct a logical, sound rationale for any actions that the elephant takes. So, where “the rider” can be paralyzed by too many options, “the elephant” needs to feel it is safe to go where the rider is trying to take him. Taiichi Ohno talked a lot about waste. He described wasteful actions in ways that made it easy to see. His point, I think, was to give his managers a clear picture of just how much opportunity there was, if only they worked to make things flow. As a sidebar, I don’t believe he made TPS about “eliminating waste” per se. He doesn’t talk about it much once he makes the initial point. Different topic. The idea of concentrating your effort into a small model area (rather than trying to take everyone along at once) fits into this. It shows people, in a tangible way, what is possible. The principle of “go and see for yourself” makes the current condition (and the possibilities) real to people in ways that the best PowerPoint presentation never can. The key is to acknowledge that “rational analysis of facts and data” rarely (if ever) evokes the kinds of things that cause change. When I read this chapter, I saw an immediate correlation with the process of rapid coaching cycles and target conditions that Mike Rother describes Toyota Kata. Aside from driving continuous improvement, that process seems to be almost engineered to shift the culture. In the book, the authors give a couple of great examples. In one, they outline an experiment with customer loyalty cards for a car wash. Two groups of customers were given loyalty cards. One group required 10 stamps to get a free car wash. The other group required 12 stamps to get a free car wash – but they were given two free stamps to start with. Thus, each group actually had the same distance to the goal. But the response was significantly higher for the second group. Why? Because they started with a sense of investment. They had runway behind them, which made the distance to close seem shorter. The two free stamps also gave them a sense that they would be “wasting” or “losing” something of value if they didn’t go ahead and complete the card. When we look at an area for improvement, do we focus on how bad it is, or do we frame our next steps to honor the work they have already done and work to build on it? We are going to be doing the same work either way, this is a matter of presentation. At the same time, do we try for the “big leap” and the 80% reduction as the goal, or do we set a series or more modest objectives that anchor a sense of success and moving forward? Do you structure a big, complex “lean implementation plan” or do you take on one value stream loop at a time? Humans are incredibly social. We want to feel we are part of a group. We want a group identity that we can share. Can you cultivate that sense of group identity in a way that aligns people in the direction of the changed behavior? What sense of identity already exists? At the same time, you can strengthen people’s resolve in the face of obstacles by predicting them. If you can challenge people to embrace what Heath and Heath call “the growth mindset” – we are going to build out competency by practice, which means failing and learning sometimes – that helps turn a surprise or disappointing result into a challenge to learn and grow. This is, in my opinion, an area where we make the biggest mistakes. A lot of efforts to implement start off with a “lean overview” of some kind – even to the top leaders – and then leaves it up to them to decide how to go about implementing all of this. But they are still operating in the same environment they always have, and no matter how compelling the vision, there are obstacles in the way. The path is not clear. The last three actions cover how to structure the process, the environment, even the organization in ways that clear the path you want people to follow. Yes, we are stabilizing and improving the process, but we are also clearing the path toward the behavior we want. If you’re trying to make a behavior easier, study it. Watch one person go through the process of making a purchase, filing a complaint, recycling an object, etc. Note where there are bottlenecks and where they get stuck. Then try to rearrange the environment to remove those obstacles. Provide signposts that show people which way to turn (or celebrate the progress they’ve made already). Eliminate steps. Shape the path. If this doesn’t sound familiar to you as a kaizen practitioner, you need to dig out the basics. This is not only exactly what we should be doing every day, it is exactly what we should be teaching others to do as well. TPS / “Lean” is a management system that strives to do this every day. The cool thing, in my mind, is that Switch is as much describing what should be our routine as it is describing how to change the routine. Can you run the McDonalds playbook? Think of the way McDonalds designs its environment so that its employees can deliver food with incredible consistency, despite a lack of work experience (or an excess of motivation). They pay obsessive attention to every step of the process. The ketchup dispenser, for instance, isn’t like the one in your fridge. It has a plunger on top that, when pressed, delivers precisely the right amount of ketchup for one burger. That way, if you have to deliver 10 burgers in a minute, you don’t have to think at all. You just press the plunger 10 times. Have you looked at your own operations through that lens? Have you made every step as easy as possible on your employees? Here is where the nay-sayers tell us “But that work environment gives people no sense of creativity.” Damn right. I don’t want any creativity around the way the product is made. I want to know that my customers are going to get exactly what was specified. The opportunity for creativity comes from challenging people to create a work environment that makes it easy to consistently deliver the product. And there are endless opportunities to do this. If / when quality is perfect, then work on productivity. So as we work to “tweak the environment” the real question for a lean practitioner is how to structure things that make and hold space for this creative process of improvement to happen. What blocks the path? Have you carved out that space, or do you expect people to just find a way to do it? And finally, Heath and Heath challenge us to look at the environment before we start blaming people. Good people working in a bad environment are often painted as flawed in some way. This is called “attribution error” – attributing bad results to the person rather than the process. I have yet to meet anyone (myself included) who was not guilty of this now and then. The people we call the “anchor draggers” and “cement heads” are making the best decisions they can in good faith, based on the environment and information that surrounds them. We have an opportunity to shape that environment, and thus alter the inputs they deal with. “Behavior” is built up from how people respond to the things around them that trigger those responses. When we talk about “habits” we are really talking about consistent responses or actions. If we want to change those responses, it is helpful to link the new response to a specific trigger. Again, looking at a TPS environment, I immediately think “andon.” There is a specific trigger (the light is ON or OFF) and a specific response. Digging in deeper, and looking at the work Steven Spear did in his original research (which is summarized in Decoding the DNA of the Toyota Production System) we see an environment that is precisely structured to provide explicit triggers for explicit actions. Further, there are processes to verify that what was expected is what happened, and any deviation triggers another specified response. So I see yet another area where the Toyota management structure is engineered to provide the kind of environment that Switch talks about. If I am trying to alter behavior, I ask the same questions. Can I set a specific trigger that calls for a specific action that I can check? Can I take something that people already do and structure the work (“tweak the environment”) so that routine action triggers the new behavior? Can I structure the work to sequentially cue the next process step as each is accomplished? And finally is reinforcing, again, the fact that humans are naturally biased toward wanting to be part of a common social structure. What is the prevailing social pressure in the organization? Is it counter to what you are trying to do? Are the people who are adopting the new behavior isolated from one another? Are you trying to spread the early adopters too thin, in the hope that they will inoculate the rest of the organization? They will inoculate the organization – by creating powerful antibodies against the change. Small, isolated efforts dissipate your resources to the point where they are ineffective. Now, having a model line does not guarantee that the rest of the organization will spontaneously adopt the new way. Far from it. It takes deliberate action. “Rally the herd” also means that the group that is doing what you want are celebrated as “doing it right.” But you have to do this in a way that doesn’t rub people the wrong way. Believe me, I’ve seen with my own eyes the pushback created when one division of a large company was constantly lauded as the “shining star” to the others. Nevertheless, you want to highlight the bright spots, and then find specific, small things that have made a difference. GM couldn’t “just be more like Toyota” or “more like NUMMI.” That wasn’t enough. They wanted the results, but apparently never dig in to truly understand the few key things that went deeper than the mechanics. Practitioners are often expected to “drive the change” into an otherwise passive-aggressive organizational culture. This can be a frustrating experience because lean practitioners are rarely given the tools to affect social conventions. It is a sad fact that the vast majority of efforts to “implement lean” falter or fail within a few years. The message that I draw from this is “Look at what most people are doing, and do something different.” The mainstream message we have been getting doesn’t work very well, and just “trying harder” is no more effective here than anywhere else. This book, with some careful study, discussion, and a little collusion, can form a great blueprint for how to actually structure your work to move the cultural change along. The key is to remember that the “lean implementation plan” is NOT about how to implement takt, flow and pull. It is a plan to shift how people behave and respond to issues every day. The tools are important, but only because they create opportunities for people to learn and demonstrate the new way of daily management. Nancy Bruner blogs on Word | Rap. Her first (and as of this writing, only) post is titled Do They Really Want a Change Agent. Since most lean practitioners are, rightly or wrongly, expected to be change agents, the points she makes caught my eye. 2. You will spend more time convincing the very people who hired you to make the changes they hired you to make than you will spend competing in the market. And there was the rub. The company, while wanting to alter their results, was (is) struggling with the idea that the leaders themselves must change the way they manage and lead if they want a different outcome. The literature, until recently, has not done much to help with this problem. The practice of leaders is starting to get more definition, but the lean community itself still has a huge inertia behind implementation methods that have been proven, again and again, to fail. There are change agents within the lean community as well. Not surprisingly, they are finding the same resistance that the practitioners in the field complain about. These are common truths spoken by people who are struggling with how to apply lean production principles to their operation. They want to do better, but don’t see how something that originated in the relentless repetition of an automobile assembly line can work for them. Another example is “Takt, Flow and Pull” as the key elements of just-in-time production. All of these things are absolutely true, but as instances of more fundamental principles. Can lean production principles be applied to a job shop? Absolutely. It just requires someone with a bit more experience who knows how to interpret the situation and apply the principles rather than dogmatically apply a standard toolbox. It’s like the difference between the author who applies the basics of creating a compelling story, and the performer who expertly interprets the script written by others. A fair percentage of them actually have underlying repetition. It is just obscured by the job shop mentality. That is, they run them like job shops, so they become job shops. Even if only a portion of the work is repetitive, slicing this off and stabilizing it creates that much more mental bandwidth for dealing with the rest of it. But even the true job shops, the ones who do custom work never to see that customer again are experts at what they do. Experience, in turn, comes from having done it many times before. There is something they are good at. Each job may be custom, but it is built up from basic elements – the things they are experts at doing. Identifying those elements can clear out a lot of the seeming complexity. True process then emerges as they focus on how those elements are executed and organized, and paying attention to the interactions between them, the people, the customer. Then they work on getting better and better at creating stable processes that may only be carried out one time. But even then, there is knowledge to be gained that can be incorporated into doing it better next time, and that is the essence of kaizen. Key point: If you are struggling with how to apply these principles, and aren’t getting answers that make sense to you, then (bluntly) you are talking to the wrong people. Keep at it until you find someone who can look at your situation and ask the right questions. In my original comments on The Lean Manager, I compared The Lean Manager‘s story structure to that of Eli Goldratt’s classic The Goal. This started a rather deep email exchange with Michael Ballé that goes far deeper into the book and the thoughts behind it than any review I could ever write. With Michael’s permission, here is that exchange, with minor editing mostly for readability and flow. My words are in blue. Michael Ballé is in black. Text [in brackets] are my additions to help context. Would you agree that Jenkinson play a different role from Jonah [in “The Goal”] ? Perhaps if the story had been written from Jenkinson’s viewpoint, with insight into his thoughts and worries about Andy, rather than a third-person view of his actions and words, I would agree. Then it would be about Jenkinson AS a lean manager. But what we have is Andy Ward’s experience of Jenkinson. Thus, I don’t get any particular insight into what Jenkinson is actually thinking about how to get his message across to Andy except in the moments when he shares his thinking in conversation with Andy. For example, Jenkinson (and Amy and Bob) are driving the concept of the problem solving culture from the very beginning. But Andy isn’t “getting it” until late in the story. What was Jenkinson’s internal response to Andy’s misguided approach? What mental PDCA did Jenkinson apply when he saw the right results being gained at the expense of the social structure in the plant? Thus, this comes across as a story about Andy Ward learning through his interactions with Jenkinson (and Amy and Bob Wood), and his experiences in trying to apply what they were telling him, rather than a story about Jenkinson’s approach to leading and teaching. The real difference between Andy Ward’s experience and that of Alex Rogo (his counterpart from The Goal) is that Andy’s boss is participating directly in Andy’s success vs. just issuing an ultimatum. Thus, Jenkinson embraces the role of the teacher as well as the boss. Yes – that is exactly the message – that “leading” in the TPS is teaching. But I think [The Lean Manager] is much more about Andy learning it than Jenkinson teaching it. The characters of Amy and Bob Woods seem to be there to add credibility since a CEO really doesn’t have this amount of time to spend with a single plant manager in a large global company. But they are so well aligned with Jenkinson’s approach that they are surrogates for him. Thus, Jenkinson is the “teacher” in a story about Andy’s insights and development as a leader. One of the writing issues we’ve had was that Freddy and one of his CEO friends felt Jenkinson was underdeveloped whereas Tom [the editor] and I felt he was already far too omnipresent compared to Andy Ward. The basic challenge for the book was to share the experience of what it feels like to be a plant manager stuck between the hammer (CEO) and the anvil (real life in the plant). Jenkinson was conceived to be this Batman-like scary character. He is a teacher, but not a very good one. Basically, his one redeeming teaching feature is his patience, but, hey, the guy is a CEO. I’ve worked with several, and then I’ve spent most of my time working with the plant managers so its the latter’s pain I wanted to share. Having said that, all your points are correct, and indeed, Freddy would agree with you. More seriously, and I hope I can convince you …that [Jenkinson’s character is not a “Jonah”] because it’s a fundamental point I’m trying to get across. As you say, the fact that Jenkinson is Andy’s boss makes it TOTALLY different from the Jonah situation. Obviously I didn’t manage to get this across well enough, but having to learn from someone who holds the sword over your head is a vastly different issue than having found a great teacher (I’d agree with Woods/Jonah), no matter how cantankerous. This learning-from-boss issue has to be my top of the list reason why lean is spreading so slowly. So I’d argue that beyond literary devices (how many lean novel plots can there be?) this is indeed a core point of the book. Where I’ve obviously not written this well enough is that Jenkinson IS teaching, but in a boss kind of way, which is a very different position. In particular, I’ve been very mindful (maybe even heavy handed) of the fundamental asymmetry between roles, and the whole issue of how to deal with a boss’ comments. By the way, Jenkinson is also doing what he can with the people he’s got (can’t replace them all, right?) For instance, you’ll notice that he gets very different responses from each of his plant managers. Jenkinson’s modus operandi is to show a lean problem to the plant manager, draw a line in the sand about where he wants him next, and push him/support him to get there; As people are different, each plant takes a very different path to lean its operations and requires a different mix or arm-twisting and lecturing. The reason we never get any direct “look” into what Jenkinson really thinks (although we do many other characters) is that I wanted to reproduce this “boss” aura – no one ever actually knows what the boss thinks. We’ve discussed this quite a bit at the time of the writing, and your comments are spot on so I’m really interested in your opinion. 1) He forces. At several points in the book, he tells people: that’s the way it’s going to be. In the German plant, in the French plant with the impromptu kaizen, with the strike, etc. Basically, he forces his managers to commit and/or do something right away IN FRONT OF THEIR TROOPS. This is a specific technique – and not an easy one. 2) He gets them to go further in their thinking. At several points, Jenkinson works with Andy to push his questioning further (not always explicitly “why?”, but it does happen. Freddy, who used to be feared because of 1), was surprisingly in the HOURS he spent doing just that. It’s equally terrifying when you’re on the receiving end because, at first, subordinates are fishing for the answer they think the CEO wants to hear, and not thinking – which makes for a lot of frustration both ways. 3) He forces people to work together, particularly when they don’t want to. Actually, Amy does this in Andy’s plant at first with the production plan issue, but Phil forces the Neville/Andy link, and later the Engineering teamwork. 4) Phil encourages “problems first” at several occasions, which is trying to tell his guys that they come to him with problems rather than let them fester, and that if he learns of the problem from someone else first, that’s bad. 5) He lectures – although this is against his own expressed principles – as he states in the car at the beginning of the book. Phil is not so enamored with the sound of his own voice as the author, but we’re still all human, right? In writing the [business novel] genre You’re stuck between expliciting the thinking (the lecturettes, love the word), and sharing the experience through an action scene. Then there are the limits of the author’s writing talent – I had to really sweat it before trying work within the plant as opposed to out of it (The Gold Mine), because trying to describe a working plant environment is something of a writing challenge. What are the explicit teaching points the story is intended to present to the reader? What does this ideal reader take away? What should the target reader do differently after reading the story? What aspect of the story gives him that insight? Did you have those things in mind as you wrote it? Or did the emerge with the story development? I see Andy as the central character of the story. It is he who undergoes the personal transformation, and the storyline revolves around his interaction with the other characters. As you intended, is a sympathetic character that many people the in the same position will identify with. Thus the learning from the book is transmitted through Andy, based on his experiences. I see Jenkinson as a (primary) supporting character, who in combination with the others, shapes Andy’s experience, and through that, shapes the reader’s experience. But in the end, he is mainly a teaching character. Yes, he is also the boss and needs the results. He leads by example. He teaches “forcing teamwork” by doing it. He makes his intentions crystal clear, does not do hollow posturing, and can play the political resistance against itself. But to Andy, he is sensei. A good student will be motivated by wanting to please the teacher. In this case, it is also an economic / career imperative, but in the end, it is about a motivated student. The key points of what to teach certainly come out in the process, including the fact that Andy learns a few things the hard way in spite of being told (like the teamwork thing). If the key point is to teach a senior executive HOW to be a “lean manager” then I guess I’d have written it from the teacher’s perspective rather than the student’s. If I were a CEO or senior executive, I’d like to know what Jenkinson was thinking when Andy was getting bogged down in distractions. If the target audience for the story is a senior executive or CEO, then I would think the CEO character has to be the sympathetic character, with the frustrations and problems that these guys can relate to. Then they can see he isn’t “Batman” in a comic-book city, but he is dealing with the same problems they are. John Shook made an attempt at that in “Managing to Learn” but the scenario was too limited to really create any dramatic “ah-ha” moments. I think Dr. Bahri’s self-experience (Follow the Learner) was a unique perspective of learning-by-doing, but, again, the scenario is too limited for most people to see beyond a medical or dental practice. With Andy as the point-of-view character, then Jenkinson’s development is appropriate. But if Jenkinson is actually the title character, then I can see where Freddy and his CEO friend felt that he should be more developed. The difference is that, to get that development, the perspective of the story has to shift from Andy to Jenkinson as well. Then the “omnipresence” drops away as an issue because it is about Jenkinson teaching rather than Andy being taught. One possible follow-on story could be this shift to the teacher’s perspective. Perhaps there is a new acquisition and Jenkinson assigns Andy to mentor the manager there through a turn-around as Andy’s next development assignment. Now Andy is the teacher, (with Amy’s help, or through the A3 process with Jenkinson), and we see the teacher’s perspective as he is trying to keep the student focused on the right things in spite of the noise and chaos that, perhaps, Jenkinson is throwing at it with his demands for performance. Andy must simultaneously understand “the main problem” in the plant, and get his student to understand it without just telling him the answers. Maybe he sees the guy as a hopeless concrete head, and Jenkinson has to force him to be patient and stick with it. What does a competent operations manager need to learn to be able to teach someone else? How does he learn it? What is the development process for that? Then we would have a story of not only how to BE a lean manager, but how to teach one to teach another. The books are about 1) teaching and 2) sharing an experience. It all flows from here – I never had a target audience in mind. The Gold Mine was all about describing TPS from the point of view of a smart guy, who’s got the power to affect changes, but has got to learn all this stuff – that was Jenkinson then. The experience I tried to share then was “The Curse Of Knowledge”. To Jenkinson most of TPS is new and counterintuitive and every time he’s picked something up, there’s more to it (and I still experience this fifteen years later), because you don’t know what you don’t know. 2) conveying the concepts, so sometimes I get it right sometimes not. Pat Lancaster of Lantech fame, made the same type of comment [about The Gold Mine] you did: “Why didn’t you write it from the plant manager’s perspective?” To convey the absolute panic of the moment you’re about to pull the plug on the MRP. The comment stuck, and eventually that became The Lean Manager. The gimmick in [The Lean Manager] is that BOTH Jenkinson and Andy are “the lean manager” – Jenkinson is the closest I can make it to a lean boss outside Toyota (those I’ve known anyway) and Andy is learning that stuff – with the added twist of the asymmetry of relationship that defines authority relationships. The Gold Mine was about TPS, and this one is about Toyota Way. My overriding problem as a consultant on the shop floor when I talk to senior execs is: “Are we on the RIGHT problems?” The problem with consultants (me included) is that they seldom understand enough of the business to focus on the right things (not a problem to Toyota consultants with suppliers, because, well, auto is auto). Will have to let this one simmer for a while. In any case, the one main point of the entire book is that you can’t do lean to someone else, and you can’t have someone else to it for you – TPS is a line management method, and a problem solving attitude. I strongly believe that this misunderstanding is at the root of the slow progress of lean – we keep preaching to the choir, but really it’s the hard nosed finance-driven managers we need to interest (more for the next book). The only way I know how to fight on the field of ideas is by writing books and then getting them into people’s hands. So now that it’s out, I’d like to get it in the hands as as many people as I can to try and change the zeitgeist… Not my favourite activity! I really wanted to share this exchange with you because it highlights a couple of the main problems that are encountered in any attempt to implement real change. “In any case, the one main point of the entire book is that you can’t do lean to someone else, and you can’t have someone else to it for you – TPS is a line management method, and a problem solving attitude. And, in the end, there it is. Ironically, if you are even reading this, you already know it. The Lean Manager is a success story, driven by the people who are actually responsible to deliver the results. While Michael and I may quibble about whether or not Phil Jenkinson is a “Jonah” character in the sense of The Goal is a discussion about literary structure rather than the core message here. What all of these books have in common is that it is the leaders who drive successful change. The “slow progress of lean” comes in situations where the implementation is delegated to staff with the charter to “do it to someone else.” And, in my experience (having spent a painful amount of time as that staff), that situation is far more common out there. I have more to go on this, but I am going to leave it for another day.